Jonathan Corbet’s analysis of the TomTom case is finally available to non-subscribers and more details on why Microsoft is likely to lose the case can be found here. 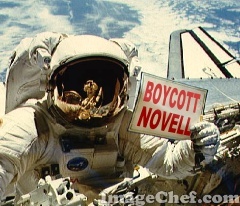 plot it knew would kill Novell. and own the “IP” rights to UNIX. play this legal card anyway. Remember that Nathan Myhrvold claims “Intellectual property [to be] the next software.” He is still very close to Microsoft and he is the world’s biggest patent troll, who is now funding a study to defend the practice. Microsoft fosters quite a pack of patent harvesters to potentially support a patent attack on Free software. TJ Chiang, a professor at George Mason Law School, wrote for Patently-O about patent trolls and this report suggests that a controversial Burst.com patent [1, 2, 3, 4] is being passed to another unnamed entity (probably a patent troll) which will seek return for this large investment. In other words, the so-called ‘inventor’ of buffering for media — as trivial an idea as it is — is enabling racketeering in exchange for money received for a piece of paper. TechDirt is a great resource for information about the troubles with patent systems, the USPTO in particular. The following 3 articles are a few days old, but they are very relevant still. As he started to write the app, he figured he should take a quick look around to see if anyone else had done so… when he came across the fact that someone had written that app, but thanks to a patent threat, it had been shut down. In fact, the patent holder, Cequent, has sued a few others who dared to create such a simple database lookup app themselves. The patent itself describes an incredibly simple database lookup… yet, now no one else is allowed to create such an app. For a variety of reasons this should be unpatentable, and so far (thankfully), the USPTO and the courts have agreed — but Harris keeps trying to appeal, claiming that a company is no different than a machine — and if a machine can be patented, so can the “paradigm” of the company. It’s way too common these days. The latest to do this appears to be Apple, who withheld a key patent on technology for online “widgets”, which has recently been standardized. The standard was set by the W3C, who asked for companies to commit their patents royalty-free in order to move the standard forward so that everyone could benefit. Instead, Apple held out a key patent, and can now start demanding people pay up. Speaking of Apple, our reader says that “Apple patents the Wii wand” and another decent article insinuates the the US patent system has gone too far. When Samuel Hopkins came up with a method for improving the production of potash, it was probably just the kind of invention that President George Washington had in mind when he created the US patent system. Hopkins, who in 1790 received the first American patent ever issued, had discovered a way to increase the production of a critical resource used to make glass, soap, and soil fertilizer. How does it feel when this very same patent system is implicitly promoting unnecessary death now? Here is the proof from Wikileaks. 3. Emergency dispatch offices in areas unable to afford proprietary scripts (especially overseas where U.S. Patent Law does not apply), developers and emergency response personnel wishing to continue the project, and bloggers and journalists wishing to document some of the unsavory ways companies utilize the patent system. Says one reader: “The patent system promotes and bribes you when you reinforce the belief system. And when you question the religion of the aborigines it would be felt as anything between heresy, intolerance and racism. So you flexibilise your viewpoint, you study the religion and the myths. “The patent system promotes and bribes you when you reinforce the belief system.”“All what you need to know about patents can be found in the study prepared by Fritz Machlup to Congress, 1958 [PDF, 24.8 MB]. A must read! With it you can debunk 90% of what lawyers tell you as unsound. This is 50 years old but it still reflects the state of the art. Tuesday, I was able to speak with Bruce Abramson, who has for years studied the copyright/patent/intellectual property rights conundrum that software presents. And he’s not shy about saying that we’re on course for a series of collisions. Michael Holsten, HP’s executive vice president and general counsel, said that his company is granted an average of four patents a day, and is constantly targeted by lawsuits over alleged infringements. I doubt that Microsoft would bother to buy Novell for the “IP”. Whatever “IP” Novell “owns” in Linux must be close to being 20 years old and thus irrelevant. Right? I think the IP issue is with respect to Unix and not Linux. According to SCO Linux uses IP that is in UNIX system V which it licensed/purchased from Novell. Since SCO was never able to produce clear cut evidence of UNIX IP being used in Linux – it’s highly doubtful that SCO and/or Novell owns any piece of IP in Linux. Just because IP is old doesn’t mean it’s useless – look at TCP/IP. Another secret wish of mine was for Novell to dust off IPX and rebuild it as a replacement for TCP/IP – oh how I wish we could get away from DHCP servers and if we could add in autobinding to DNS – wouldn’t the Net Admin’s life be grand?